Police at the White House broke up a protest by the unemployed on March 6, 1930. The demonstration was part of the first nationwide protest response to the Great Depression that had begun the previous fall. Protests were held in Detroit, New York, Baltimore, Chicago, Boston, Milwaukee, Seattle, Las Angeles and San Francisco among other cities. Demonstrations were also held on the same day in cities around the world. Pickets arrive at the White House, March 6, 1930. Photo courtesy of the LIbrary of Congress. The clash began when District of Columbia local Communist Party leader William “Bert” Lawrence stopped and began to speak to the crowd, police in street clothes attacked him. Uniformed police then assaulted the picketers and bystanders with tear gas and black jacks. Some the protestors fought back against the police. Some reports said President Herbert Hoover watched the demonstration from the White House windows along with a delegation from the District of Columbia Society of the Daughters of the American Revolution (DAR), while other reports had his wife watching along with the DAR. The District of Columbia Communist Party and allied groups began preparations in the city for weeks before and police responded by arresting 10 people on April 30 for holding soapbox style speeches on the street corners near the Communist Party headquarters at 1337 7th Street NW. Similar meetings and police harassment took place at the Women’s Christian Temperance Union statue at 7th Street and Pennsylvania Ave. NW. The communists and along with others held a rally the night before at the Communist Party headquarters where speeches were given and signs were made for the next day’s demonstration. The main themes were demands for good jobs, against police brutality, Jim Crow schools in the District and lynching. 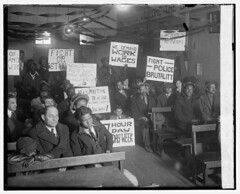 Among the organizers were Lawrence, Solomon Harper of the International Labor Defense and Edith Briscoe of the Young Communist League. Briscoe was among those arrested at the White House picket line after she jumped on the back of a police officer he was getting ready to strike an African American demonstrator. Lawrence was detained and charged with speaking in a public place without permission. Harper was arrested for disorderly conduct, but was acquitted. He still faced charges from an outdoor speech he gave the night before condemning the lynching of sixty-year-old Laura Wood at Barber Junction in North Carolina. 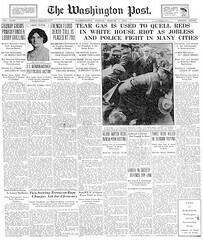 Jobless pickets are the lead story for the Washington Post, March 7, 1930. Public demonstrations of this type were fairly infrequent at that time and public protests involving blacks and whites even more infrequent. The picket in front of the White House was held with blacks and whites locking arms while picketing. Press reports estimated that several thousand nearby office workers came out to watch. The newspapers also indicate that 13 picketers were arrested with an unknown number of injured, but only one that required hospital treatment. The demonstrations made front-page news and were the lead stories in the Washington Post and Baltimore Sun and helped put the Communist Party at the forefront of the fight against unemployment and racial discrimination in the District for the next decade. 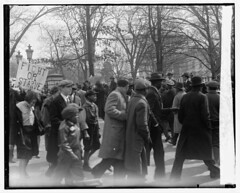 To see still photos of the March 6, 1930 demonstration, go to the Washington Area Spark Flickr site. The photos in the short video are courtesy of the Library of Congress. The video clips were originally from Sherman Grinberg, but are believed to be in the public domain. The clips were misidentified as part of the the 1932 bonus march in a Newsreel production. The Library of Congress has mis-dated some of the photos to a period earlier than they actually were taken. Note: This post was updated February 28.